Tomaz di Cunto performs under the name Toco, which is Portuguese for ‘play’, as in to play music. He is a vocalist, guitarist and composer whose work decisively and intoxicatingly recalls the golden age of jazz and bossa nova. In fact, he transports us back so effortlessly and completely it seems like a golden age which has never passed. Toco has been making records in Milan for the Italian Schema label but hails from Brazil, as his music so clearly reveals. Working with the Milanese acid jazz producer Stefano Tirone, Toco’s reputation has been steadily building thanks to a string of notable recordings and he recently came to prominence when a track of his was featured in the film Silver Linings Playbook. Toco’s new album Memoria features a large and fluid line up of musicians, but the nucleus consists of Eduardo Taufic on piano and Fender Rhodes, Edu Hebling on double bass and Brazilian master Mauro Martins on drums. But everything here is in support of Toco’s relaxed, engaging vocals which are quietly irresistible. It’s an impressively unified piece of work, a diverse but harmonious mood tapestry. And it’s the perfect soundtrack for summer, with its ethereal floating bossa groove. Cigana (‘Gipsy’) is almost a secular psalm, a sensual prayer. It features the gorgeous voice of Nina Miranda, like a more voluptuous Astrid Gilberto, and Marquinho Baboo on percussion. The classic bossa nova feel is blended with delicately handled electronic atmospherics and there are hints of Miles Davis in the ghostly reveille of an uncredited trumpet (quite possibly Marco Brioschi who plays elsewhere on the album). In contrast Breque Bom has a relentless driving beat — appropriately enough for a tune whose title means ‘Good Brakes’. Producer Stefano Tirone sits in on guitar and Wurlitzer and there’s a hint of vintage Doors here. O tempo é aqui (‘The Time is Here’) is more mournfully acoustic, with tightly synced backing vocals which give a moody, smudged effect and dreamlike reverb. The production throughout this album is excellent — unobtrusive but subtly culminating in a richness and feel that makes for a very distinctive mood. Eduardo Taufic’s Fender playing on this song is selective and superb, shadowed by his dark, resolute acoustic piano. 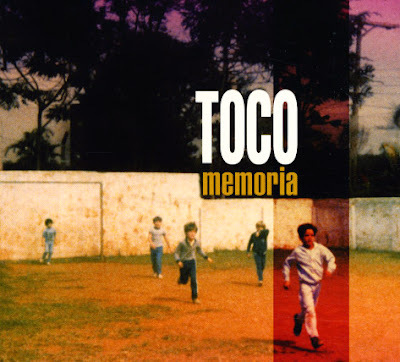 Considering the atmosphere conjured here, it’s no surprise that Toco has previously recorded a track called Samba Noir. Divino (‘Divine’) has a touch of ghostly melancholy, bossa nova style, and a Morning of Carnival mood in its introduction. But it develops in a fascinating direction with the entrance of Francesco Saverio Gliozzi’s evocative sad sawing on cello. Gliozzi is part of the String Island Quartet, along with Luca Campioni and Andrea Aloisi on violin and Elisabetta Danelli on viola. The string quartet underpins this piece and expands its sound world, adding to the effortless, agreeable melancholia of it. And it becomes clear here why Mauro Martins has such a reputation. His drumming is outstanding, soft, organic and flawlessly precise while Marquinho Baboo’s inconspicuous percussion provides flashes of colour. This song has the percussive minimalism of classic Gilberto and Jobim but with subtle electronic touches and atmospherics like the whispering multi-tracked vocals. In Mané Eduardo Taufic’s chiming Fender Rhodes provides glowing stepping stones for the band and introduces a flourishing horn section with Marco Brioschi on trumpet, Beppe Caruso on trombone and Germano Zenga on tenor sax. But Germano Zenga really gets a chance to show what he can do on tenor with his extended solo in Meu Rio (‘My Rio’), a song in which Toco name-checks Jobim, while Beppe Caruso shines on Sem par (‘Matchless’). Vendaval (‘Gale’) is a lazy, blossoming bossa and Francesco Saverio Gliozzi’s cello gives it a wonderfully bittersweet dimension. Eduardo Taufic’s sparse, poignant piano and the chorus and echoing backing vocals give the piece a tender sense of loss. There is almost a heartbroken country and western wistfulness to the song. It’s amazing that such ostensibly sad music can invoke such an intense mood of happiness in the listener. A concealed track featuring the String Island Quartet waits like an Easter egg at the end of the album. I might never have discovered it if a cat hadn't taken up residence on my lap and prevented me from getting up and turning the hi-fi off when the CD ended. It’s the perfect conclusion for this haunting, mysterious and endlessly listenable album. Wonderful review, wonderful album. And you're right about Vendaval -- it's the happiest sad music I've ever heard.